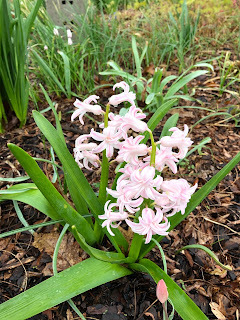 Welcome to Garden Bloggers' Bloom Day for April 2019. Here in my USDA Hardiness Zone 6a garden in central Indiana, spring continues to roll through the garden at what I consider a comfortable pace. We've had a few warm days but yesterday, when I took most of these pictures, was rainy and cold and rainy. It was the kind of weather that slows spring down. However, looking back, I find this bloom day is much the same as last year's, which I thought was a quick, warm spring. So I looked back another year and saw that two years ago was the quicker spring. My estimate is it was a week or two ahead of this one. You just never know so I just plant and then let Mother Nature decide when flowers will bloom. 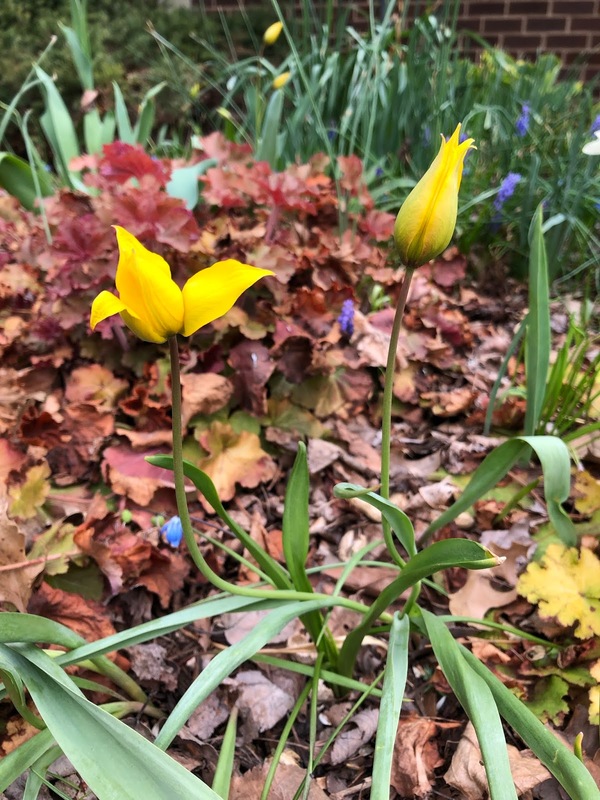 Right now, the woodland tulips, Tulipa sylvestris, are blooming in the front garden. This species tulip is a reliably returning tulip so far. It is also one of my favorite tulips. I will order more bulbs of it to plant this fall. Around in the back garden, I thought we'd just have a look at one border around the honeylocust tree. I call this border Bird's Blanket because the idea is that it should be like a quilt of calm flowers and greenery underneath the tree. 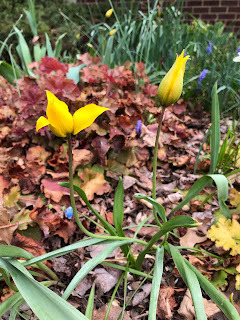 I've tried to plant mostly white and pink flowers in this border, but a few soft yellows creep in occasionally because it is also a good place for flowers that like shade, like our native trout lilies. Here's what's going on in that border. The Christmas roses are still blooming. 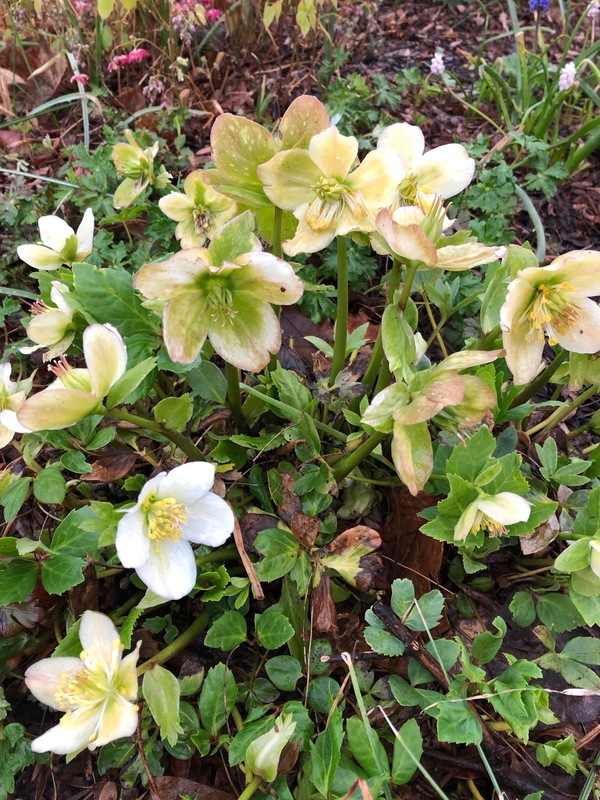 This one might be Helleborus niger 'Cinnamon Snow'. This is another H. niger, the variety name is lost in a pile of plant tags. 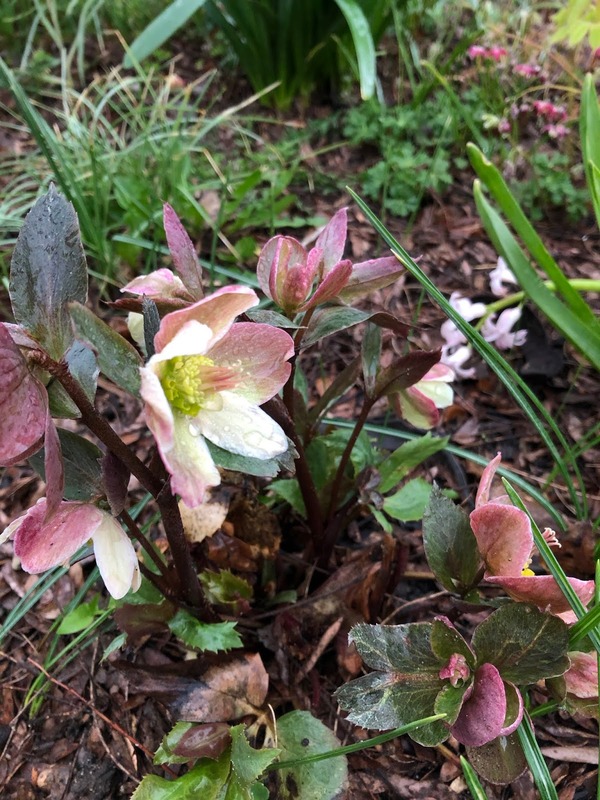 The hybrid Lenten Roses are blooming in another border. 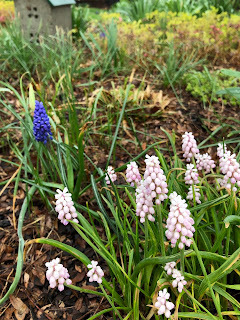 I do have pink grape hyacinths in this border, Muscari 'Pink Sunrise'. I need to dig out that blue grape hyacinth and relocate it to someplace else. It's ruining my color scheme. I have some light colored daffodils in bloom there, too. Variety unknown. Sorry about that. 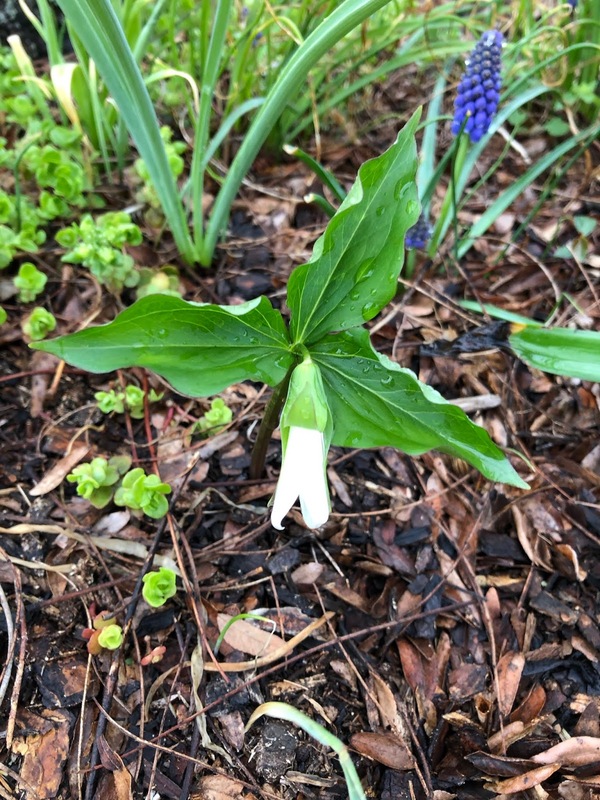 A Trillium is getting ready to bloom. This is T. grandiflorum, with another grape hyacinth I need to move. Grape hyacinths do tend to spread and seed about. If you don't want that in your garden, don't plant them. I am enjoying this heirloom Hyacinth, the variety 'Chestnut Flower', which has double-flowering florets and a nice scent. It goes nicely with these species tulips, Tulipa clusiana 'Lady Jane'. 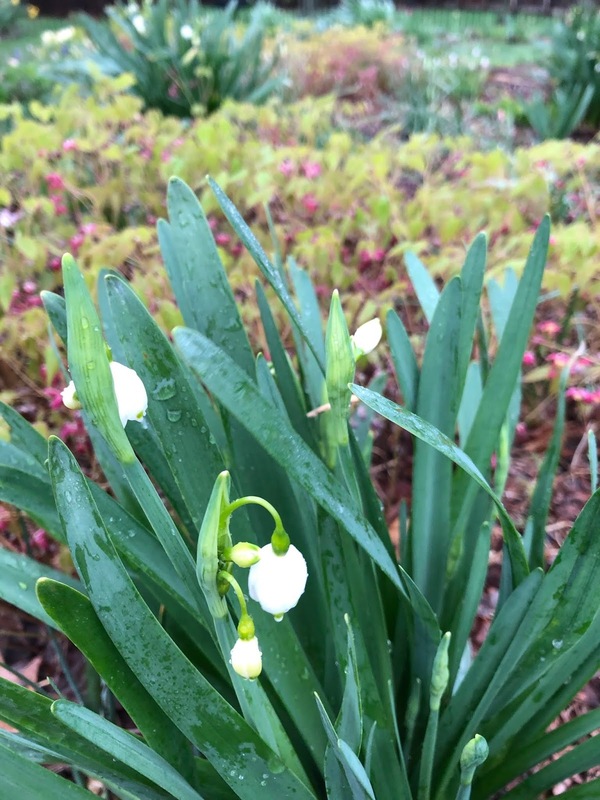 The first of the summer snowflakes, Leucojum aestivum, are also just starting to bloom now. You have to watch these as they will also seed all over. I dug up clumps of them a few years ago, gave them away with a warning about the reseeding, and now I am careful to deadhead those that are left before they set seed. 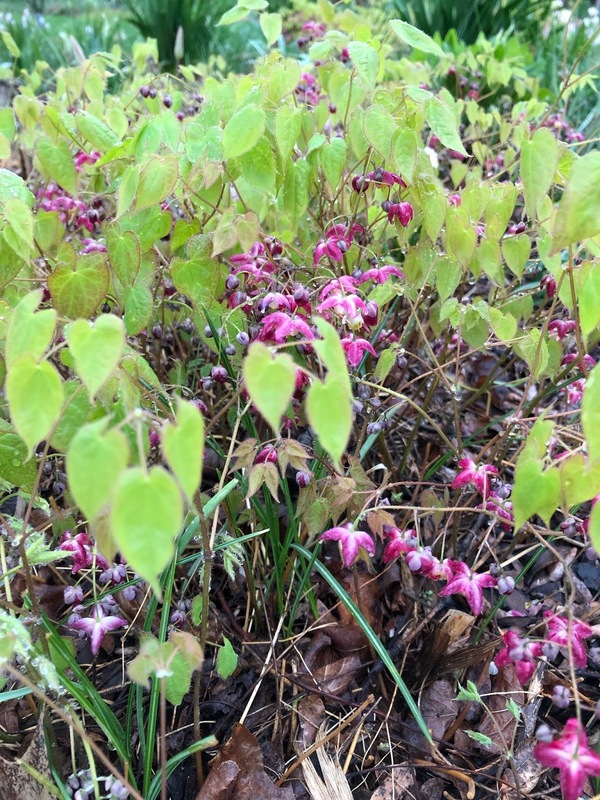 And finally, we have some Epimedium in bloom. I like its common name, Fairy Wings. Elsewhere in the garden, well, come back in a few days because it looks like pearlbush, flowering quince, pawpaws and the crabapple tree are just about ready to pop, just in time to miss out on bloom day! 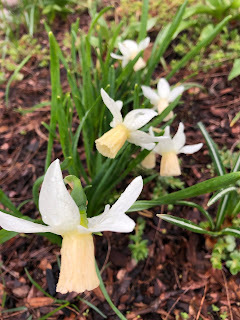 Or if you want to hear more about the goings on around here, listen to my weekly podcast, The Gardenangelists, with Dee Nash of Red Dirt Ramblings. We talk about flowers, veggies and all the best dirt, and we always laugh at least once, if not twice, sometimes thrice! New episodes are usually uploaded late on Tuesdays. This week will be talking about... listen to find out! What's blooming in your garden on the 15th of this month? It's easy to join in for Garden Bloggers' Bloom Day and show us. 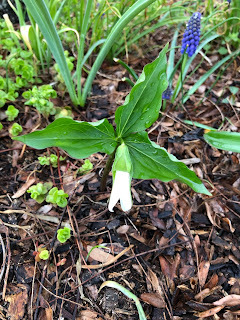 Just post on your blog about the blooms in your garden and then leave a comment below to tell us what you have and a link in the Mr. Linky widget to tell us how to get to your blog. Happy BloomDay from the Left Coast ! Happy Bloom Day from Long Island Carol! Spring has finally sprung here as well with lots of bulbs coming up. I would say we are also about two weeks behind last season, but the almost 70 degree day today speeded things up! A beautiful tapestry of colour called Birds Blanket - what a great idea! Leucojum are such stately flowers, I have a few clumps here, but I will add more to my bulb order in autumn. Wishing you the happiest of GBBDs! Despite spring merrily kicking off here in the UK, I'm contemplating the value of dead flowers in the garden! It always amazes me that we can have gardens many thousands of miles apart and yet still have very similar things in bloom. And similar weather for that matter too. Happy Bloom Day Carol, Spring has sprung! So many of us are "marching" through spring together now (but in different parts of the process). It's part of what makes an April GBBD fun, especially (like yours) gardens ahead of mine. My hyacinths are just starting to form buds and I think I took a hit with my tulips, but it's good to know spring is finally here for all of us. You have lots of spring pretties, I hope your weather will echo that soon enough. I'm especially taken with the Hyacinth 'Chestnut Flower'--really lovely. Thanks for hostessing this fun meme for blooms. Carol, it's beautiful to see spring bulbs more in bloom! What a fine time of the year! Our recent snowfall sets us back a bit but we're still anticipating more warm spring days! 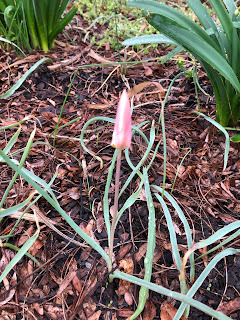 Your post reminds me again that I need to hunt down some species tulips to plant next fall. Spring is in hyperdrive in my part of the country - in fact, you could say we're halfway to summer. As always, thanks for hosting GBBD, Carol! Hi ,Am I the only one out from US region and belonging from Asian region ,we are into beginning of summer with spring blooms disappearing each passing day.Temperatures are relatively quite high at this time ,loved your blooms from bulbous family ...hope you have marvellous blooms in upcoming days. have a great week ahead . I LOVE those pink muscari! So pretty! 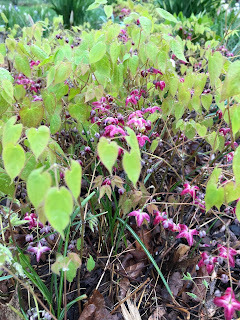 Also, the Epimedium is new to me. Lovely! My first GBBD post this year (I think) - have added link. I think your garden is a week or two behind mine but its so nice to see the spring flowers appearing isnt it. I used to have Tulip sylvestris, you have reminded me to buy more. We have very similar plants flowering at the moment thousands of miles apart! Love epimediums, such pretty flowers. 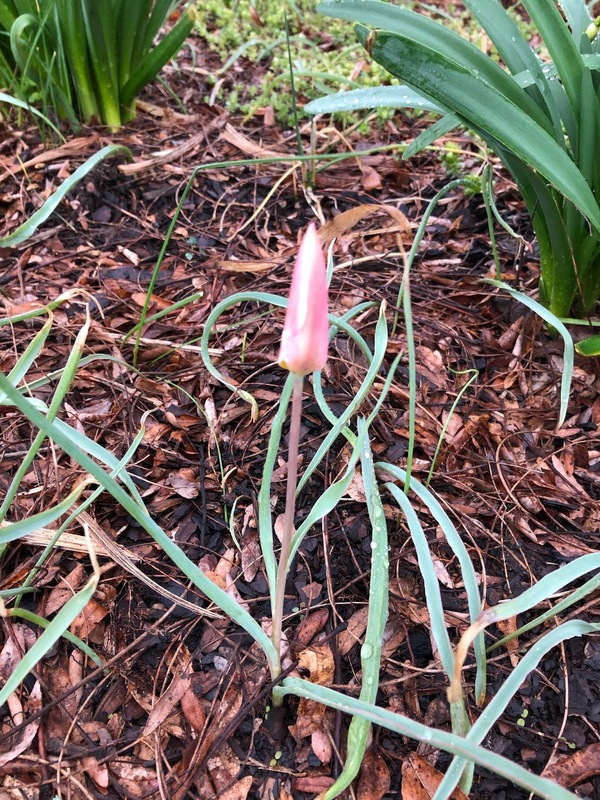 Thanks for the ID on the Woodland Tulip - I have one that bloomed earlier in the month, but I did not know what it was. Actually I do not remember ever seeing it before, so how it got to my garden is a mystery! Such pretty little grape hyacinths! I think they add a nice touch of color to the beds! Of course, mine haven't taken over yet. Carol - Your garden has so much in bloom. Here in Massachusetts there is very little bloom. But we are glad to see all the green shoots and buds. I also have grape hyacinths in my new garden, but I am confused. There seems to be so much greenery. I think it is left over from last year. There are no blooms. Should I have cut back that greenery last fall. I hope you or someone can help me. Happy Bloom Day! Your blooms are looking lovely! Thanks for sharing. Happy Spring--great to be back in the garden! Happy bloom day from the lower left corner (San Diego)! I did it! Better late than never - Curses on whomever set tax day in mid-April!!! Anyway, your garden and mine are pretty parallel in bloom this month. I need to add "listen to Gardenangelists" podcast to my to-do list! Carol, I'm late because I had to wait for spring to get here. ;-) As always, as the snow melts and my first flowers bloom, I am happy to visit your garden for a preview of coming attractions. Happy spring! and thank you for hosting this monthly celebration. Wow, this is really amazing and i have bookmarked your blog. Thanks for your valuable information . I will read regularly.